A lifting injury when he was about 19 sent Dr. Tang in search of a solution. His persistent low back pain didn’t respond to medicine, and that’s when he went to the chiropractor. Though he was unfamiliar with chiropractic care, Dr. Tang’s father worked as a surgeon, and it piqued his interest early on in health care. He would shadow his father and even observed surgeries when growing up. To this day, Dr. Tang’s passion is learning, and he enjoys working with multidisciplinary practitioners every day at Health Quest Physicians Group that he can gain knowledge from. 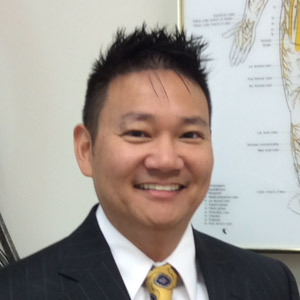 Dr. Tang attended Logan College of Chiropractic, graduating with honors. He immediately put his chiropractic education to use by joining Dr. Owens in practice. He’d learned many chiropractic techniques during school and was honored to be certified in the three primary techniques utilized: Diversified, Thompson and Activator®. Additionally, he is certified in acupuncture. His physician father trained in acupuncture and Dr. Tang was always fascinated by the acupuncture model in his dad’s office that showed the meridians of the body. Dr. Tang uses the same model in his office today to educate patients about acupuncture. He’s also works with in Kinesiology tape, which is used on many of his patients who are athletes. Dr. Tang works with all ages, especially senior citizens who may have dealt with health challenges for decades. He enjoys seeing them get relief through chiropractic care. It’s also easy to co-manage your case between multiple practitioners with all of them at a single location. Joining Health Quest Physicians Group was a natural choice for Dr. Tang. He’s long had an affinity for Jefferson City and the down-to-earth residents. As it’s the only clinic of its kind in our area, there are many ways to help you get better at our office. When he isn’t helping patients, Dr. Tang stays active by working out. Passionate about practicing martial arts in his spare time, he holds a black belt in tae kwon do. Thanks to the Internet, he can often indulge his love of learning online, researching his different interests or catching up on the news. Visit our health center and benefit from our many practitioners’ years of experience. Schedule your time today! We look forward to meeting you.